Do you want to let more natural light into your home? Do you want a room where you can enjoy the outdoors but not have to be bothered by insects and uncomfortable temperatures? If you answered yes to either of these two questions then you might want to consider building a three or four season sunroom addition, or buying a home with one. 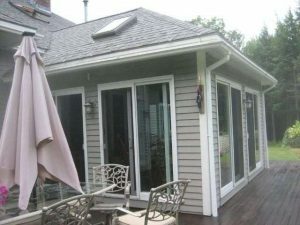 Sunrooms are the ultimate solution for providing outdoor living space, but without actually having to step out into it. Sunrooms come in all shapes and sizes. Some are insulated, such as a four season sunroom, and some are not, as in the case of a three season sunroom. If you are contemplating building a sunroom addition there are several considerations to think about. First, do you have a large family? If so you may want to make a large sunroom that can easily support all the members of your family. Second, what are the possible locations and orientations of your sunroom? Preferably you want it facing the sun when you anticipate using it the most. For example, if you want a sunroom to enjoy the weekend mornings you may want the home to face the east or southeast. On the other hand, if you expect to use the sunroom mainly in the late afternoons, then you may want to position the sunroom so that if faces the west or southwest. Another major consideration is the weather in your region of the country, or world. If you live in a cold climate you may want to position the sunroom so it faces the south or southwest to maximize the amount of sunlight into your home during the low angles of the sun during the winter months. If you live in southern climates you may want to position the sunroom towards the north so that the sunroom does not get too hot during hot summer daylight hours. You may also want to build the sunroom off of a particular room of your home. For example, you may want it located directly off of your kitchen so that you can effectively use it as an extension of your kitchen. Alternatively, you may want it off of a great room or family room. Of course the location of the sunroom is somewhat governed by the shape and style of your home and your lot size. Make sure to check with your local building inspector to see what your options are for building a sunroom addition onto your home. When designing a sunroom make sure to include not only windows along all outer wall surfaces, but also on the roof. Skylights really brighten up a room. Moreover, you may want to include sliding glass doors on each exterior wall of the sunroom for easy ingress and egress into/out-of it. Also, it at all possible, include a cathedral ceiling and high walls in your sunroom. They give the room a breezy and more openness feeling, and the cathedral ceiling works best for skylights and ceiling fans. If you plan on designing a large sunroom you may want to consider installing a hot tub. Lastly, consider what you may want for window treatments. At night sunrooms can look very dark from all the black window surfaces, and they offer little privacy. Light window treatments can help make the sunroom feel cozy at night and provide some level of privacy, while at the same time not significantly impeding the flow of sunlight into the home during the daylight hours.